The second bishop of Little Rock didn’t want the job. Not at first, anyway. But Father Edward M. Fitzgerald was commanded to obey the papal decree of April 24, 1866, appointing him to the post, thus beginning an episcopacy of 41 years. After his consecration Feb. 3, 1867, in Columbus, Ohio, Bishop Fitzgerald arrived in Helena, Ark., by steamboat six weeks later. At age 33, the native of Limerick, Ireland, was the youngest bishop in the United States. The first order of diocesan business was rebuilding churches and mission stations ravaged by war and neglect. Only five priests served a largely impoverished population of 1,600 Catholics. Parishes were scattered and postwar Mass attendance usually amounted to little more than 20 at wood-frame or log churches in Fort Smith, Helena, Little Rock, New Gascony and Pine Bluff. The new bishop gave evidence early on of a learned, logical mind. Summoned to Rome for the First Vatican Council in December 1869, he was one of two bishops to vote against the dogma of papal infallibility — an act that earned an entry in Universal Church history as “Big Rock versus the Little Rock.” Bishop Fitzgerald explained later that he voted as he did because he believed affirming infallibility would hinder his efforts to convert non-Catholics back in Arkansas. Throughout his service to the diocese, Bishop Fitzgerald battled the impression of Arkansas as an inhospitable place, given its crop failures and its battles with yellow fever and other diseases. He rebuilt and solidified the church infrastructure by establishing parishes, ordaining priests, recruiting sisters and encouraging Catholic immigration. A shrewd businessman, Bishop Fitzgerald negotiated with the Little Rock and Fort Smith Railroad Company to grant tracts of land to new arrivals from Germany, Italy, Poland and Switzerland. 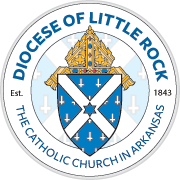 The Benedictine and Holy Ghost priests arrived in Arkansas, as did two orders of Benedictine sisters and the Sisters of Charity. St. Benedict’s Priory (later New Subiaco Abbey) arose in Logan County on 640 acres donated to the Benedictines by the railroad, along with $2,500 in cash. The persuasive young bishop, a forceful speaker, succeeded in collecting most of the $70,000 that led to laying the cornerstone on July 7, 1878, for a new Cathedral of St. Andrew in Little Rock. The Gothic structure of native granite was consecrated three years later for a congregation of 1,500 on the first Sunday of Advent. At his silver jubilee in 1892, the once-reluctant bishop counted 32 priests, 31 schools and 58 churches either built or under construction in a diocese of 10,000 Catholics, excluding 5,000 more in the Indian Territory. 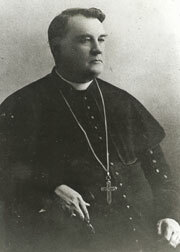 Bishop Fitzgerald suffered a stroke in 1900, and was paralyzed. He died Feb. 21, 1907, at St. Joseph Infirmary in Hot Springs, with his coadjutor bishop, John B. Morris, at his side. When his remains were brought by train to Little Rock, a crowd of 5,000 had gathered at the Rock Island station. To learn more, read Arkansas Catholic.